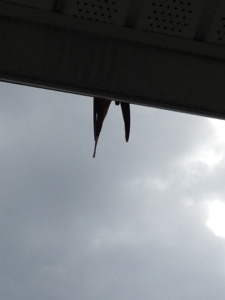 We had a bunch of barn swallows up on the gutter making a racket. Got to thinking about reports of dead birds in massive amounts. What’s killing them? Toxins, lightning strikes, electromagnetics, HAARP, natural deaths or nefarious kills? No idea if the bird flu is to blame. In the news is drones, robotic bugs and insects spying on the people who paid for them. That would be you and I, the taxpayer. Is it plausible the bird kills are intentional b/c they have been armed with cameras or spreading disease, intentionally or otherwise? Twitter has a bird as its logo and that’s why when you join, you’re an egg. And your home button is a birdhouse. Tweet, tweet. In case u were born stupid, Twitter is monitored by a host of government agencies. All tweets except for direct messages are stored in The Library of Congress. Hello. You may want to flip the bird, but someone is watching.